We offer two cottage houses for rent together or individually during the summer and some Holidays. 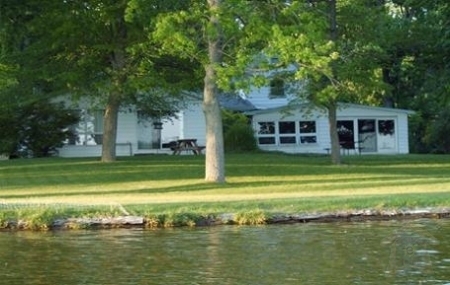 They are on adjacent lots on the North Shore of Lake Brownwood, in quaint Paw Paw, Michigan. One has three bedrooms and a bath and a half. It sleeps up to eight, if one is a smaller child for the upper bunk (limited ceiling clearance). The other has one large bedroom and one full bathroom and will sleep up to 6, when rented with the larger cottage. The combined property (4 bedroom, 2.5 baths) sleeps 14. The cottage vacation rental units are both lakeside and 50 feet from the beach. The cottages are clean and pleasant but the lake is sensational. The shallow, sandy bottom is great for wading or just hanging your feet off the dock. Kids love it. Both cottages are rented as a set, i.e. 4BR/2.5BA with two complete kitchens and living rooms, Memorial Day to Labor Day. If available, cottages are rented individually 45 days prior to arrival as well as before Memorial Day and after Labor Day. The cottages share the water pump, dock, telephone/internet service, pedal boat, fire pit and the laundry room. They are self sufficient otherwise. They are located three miles north of Paw Paw, Michigan. Paw Paw is about half way between Chicago and Detroit along I-94. Lake Michigan and Kalamazoo are easily reachable within 30 minutes. Saugatuck is 45 minutes and Holland is a little less than an hour by car.